This started as a comment on Martin’s post about problems with Vista but grew a bit too long so I have put it here. I have too many machines (can you have too many :-)) the one I use most is the MacBook (especially now I have discovered it is Unix really), then the little Linux Asus which is an amazing blend of very easy to use and versatility, last my Vaio with XP (in a cupboard at work for the last month). There are a few applications that are handy for the PC but otherwise somehow it isn’t the best to use. The best free stuff is in the Unix world – Mac and Linux give you access. The advantage of the the PC used to be that you didn’t need to think about how it works – but with online updates and validations then it looks like you do. I am also looking at alternatives for Word at the moment so MS is becoming less important for me – because things do not interoperate fully rather than down on the applications themselves. If Word had an uncluttered export of HTML or XML then I would be happy sticking stuff in it, but it doesn’t so that generates a whole new job of reformatting, cutting and pasting, and general fiddling with documents that should not be there. This really hits me in my role as a journal editor. So at the moment I feel my world may be in transition and I have been trying out some alternatives – XML editors, LaTeX, Google Docs, etc. I will try to write more later but i am feeling a pull away from the institutional preferences towards alternative application mixes – and just if you are like Martin and your Vista machine refuses to let you do anything! Asus eee on trainOriginally uploaded by openpadJust a brief note about going to the JISC CETIS conference. I decided to carry on the live blogging that I started at the OpenLearn2007 conference by blogging during the CETIS conference. I did that using my other account across at http://ochre.wordpress.com, but thought I would note here that the little Asus proved a great tool for the job. While other people balanced their Macs and laptops on their knees the Asus eee was a much neater solution and I also felt it helped my typing even though the keyboard is a bit small and with a slightly strange layout. A better battery life would be great but I managed to grab just enough access to a power socket. 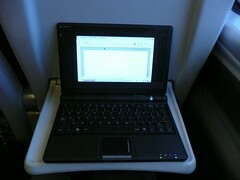 The picture shows the Asus eee sitting on the silly little pull down shelf on the Virgin train. If fits! The PC is a great design and I am getting more and more enthusiastic about them. I took my Asus in to work for a meeting today – it was an item of interest though Grainne had not brought the white one from her project Grainne had brought the white one but didn’t show off by bringing it out of her bag, though she had also put its picture on her blog. Anyway Hardin Tibbs was in the meeting with his iPhone and so there is a chance to determine the question – which is the current cooler product iPhone or Asus?I took the chance to take a picture of the two together – see below. In the pictures you will also see some other pieces of kit, a WD Passport 250Gb USB drive – which is a neat solution to the storage limitations of the little Asus, the Mac that I hope to stop having to carry so much and a JVC MG575 HD camera that has also proved to be a useful device. 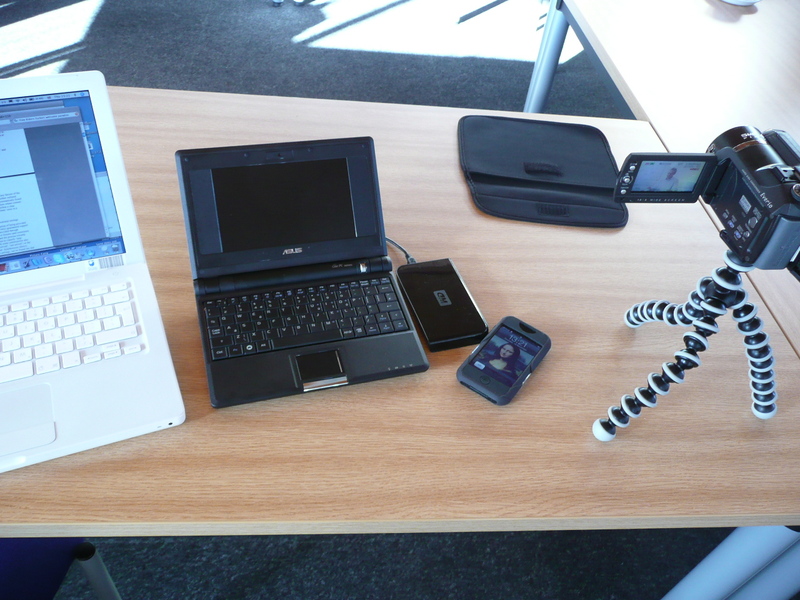 The camera also is a good partner for the Asus – its MPEG2 files are a pain to play back on the Mac but the Asus happily decodes and played them back. The Mac is there as after 3 hours (of a 4 hour meeting) the Asus battery gave out – which is a bit disappointing but not too bad. 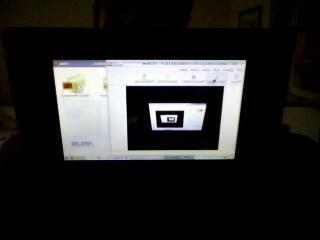 Asus eee is girl’s toy! Well I was wondering what role the little Asus would have. When my daughter came home the answer was easy – it is her machine. 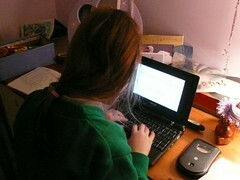 She happily played the typing tutor, looked through the games and used the free wordprocessor to do her spelling homework. Not too sure how to get it to print to our Canon printer – I had to admit defeat with our last Linux machine. 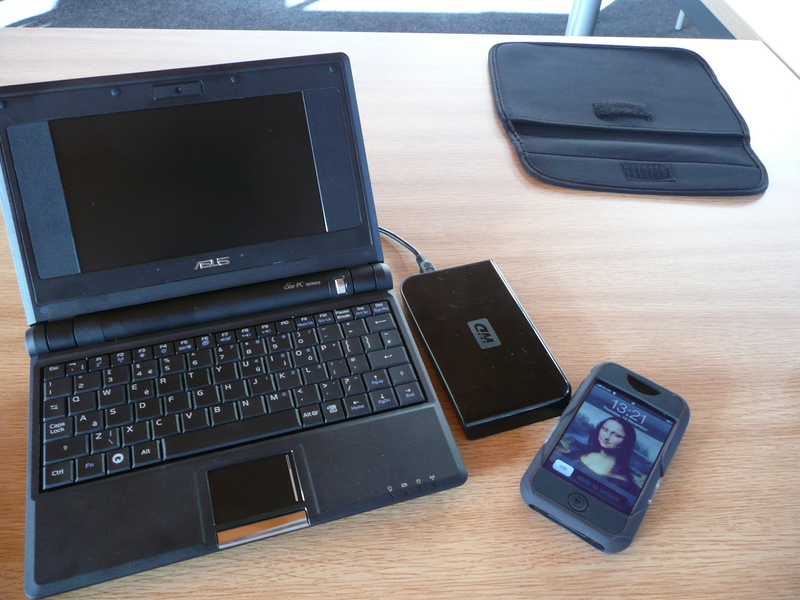 The Asus eee PC that I ordered yesterday arrrived almost exactly 24 hours later – so I now have it. It seems a very neat device with a lot of useful software installed. It looks like it could be an ideal child’s computer or as Marc has suggested perhaps a ‘third computer’ to go along with desktop and laptop. The only problem is in my case I think it is probably my seventh computer so I am not too sure why I bought it – maybe I got caught up in the launch fever and spotting that they were not so hard to buy after all. It has a built in camera so here is a picture of it taken with it.